Jersey Hockey’s Junior Boys U16s started their English Championships 2017/18 campaign with two matches at Sevenoaks HC in Kent on Sunday against Sevenoaks and Canterbury. The Boys entered the top tier of the National Competition and although they knew they would be playing against some of the best players in the country the squad travelled in confident mood. The boys went to the UK along with the Jersey Girls U16s, who were also beginning their matches on Sunday in Hampshire. The Sevenoaks boys were a very well-drilled and organised team, showing excellent speed, movement and close control. They put the Jersey defence under early pressure but against the run of play Jersey scored two excellent goals from Rhys Thomas and Tom Heelis following good work from Charlie Mossop. At the start of the second half Sevenoaks began to turn their possession into goals and despite the tireless running of Jersey Captain Adam Gower and heroics of the Jersey defence, especially man-of-the match Jersey keeper Piers Brandie, Jersey found themselves 4-2 down. Jersey pressed and scored from a powerful Heelis flick but a flurry of late Jersey short corners did not deliver the equaliser. The Jersey boys picked themselves up well and started strongly against another well organised and talented Canterbury side. Jersey had all the pressure in the first half but did not take advantage of their dominance. In the second half Canterbury were more clinical and took the lead from open play. The game was more balanced with chances at both ends but it was Canterbury who took theirs with a second goal from their centre-forward. The boys had competed really hard in both games but the results have left only slim qualification chances to progress to the Regionals round. The squad will re-group and prepare for the next match which is against Guernsey’s U16s Boys here in Jersey on Sunday 21st January 2018, a double-header for the U16s InterInsular which Jersey holds after a tense 3-3 draw last season. That game will be part of a four match U16s InterInsular Festival comprising the Girls’ and Boys’ InterInsulars and then two mixed U16s inter-island matches. In their first match, Sevenoaks began strongly, moving the ball quickly and accurately and put the Jersey defence under early pressure. The early storm was weathered and then from Jersey’s first attack the ball came into the D from the left and striker Rhys Thomas forced the ball home. Jersey forward Jacob Bell then intercepted a Sevenoaks’ defender’s pass and drove into the D but his reverse stick shot flew over the bar. Sevenoaks pressed again and were causing Jersey problems, but the Jersey defence was well-marshalled by Xav Barette and Chris Carnegie and stood resolute. Somewhat against the run of play again, Jersey scored another. Attacker Charlie Mossop won the ball from the Sevenoaks defence and intelligently eliminated the keeper by crossing the ball to Tom Heelis whose first time shot buried into the backboard. Turning round two goals to the good but having been defending hard for most of the half, it was imperative not to concede early in the second period but unfortunately the Sevenoaks attacks started to count. Despite Jersey’s best efforts, Sevenoaks’ finishing was clinical and a raised reverse stick shot, an excellent deflection and two well worked open play goals over a period of 13 minutes found Jersey now two goals behind. In Jersey’s goal, man of the match Piers Brandie had been pulling off brilliant saves but there was nothing that he could have done against any of the goals. Jersey changed formation to try and get back into the match and had their best period of the game. Chris Thomas and Rory MacRae in attack were being fed well by midfielder Jamie Watling and Jersey were creating chances. The Sevenoaks keeper made a great save from a close-range Mossop first time effort and then Jersey scored a deserved goal to set up a great finish. Bell flew down the right wing after mugging his marker, combined well with Mossop which led to Heelis picking up the ball in the D and his powerful flick found the roof of the net. The final 10 minutes saw Jersey press hard to find the equaliser with Captain Adam Gower working tirelessly to drive the team forward. Jersey forced three short corners during this period but unfortunately could not find that elusive goal. After a short break, the Boys had to pick themselves up following a disappointing defeat. And that’s exactly what they did. Jersey started strongly with Toby Treharne working tirelessly up and down the pitch and were dominating the midfield and creating chances. The Canterbury keeper made a string of saves from Rhys Thomas and Gower and the Canterbury defence kept out Jersey’s short corners. Canterbury came into the match a bit just before half time but two good saves from Brandie kept the score-line 0-0 at halftime. After the break, Canterbury were more assured and the game was more even but Canterbury were more clinical in attack and took the lead when the ball found its way to the Canterbury centre forward close to the goal. The Jersey team pushed forward in search of the equaliser but that left chances at the other end and the game was becoming end to end. With five minutes left and Jersey on all-out attack, supported by defenders Robbie Forrest and Aidan Boyle who were having great games, Canterbury broke and from a resulting melee in the Jersey D, the Canterbury centre forward added his second, which was the final goal of the game. 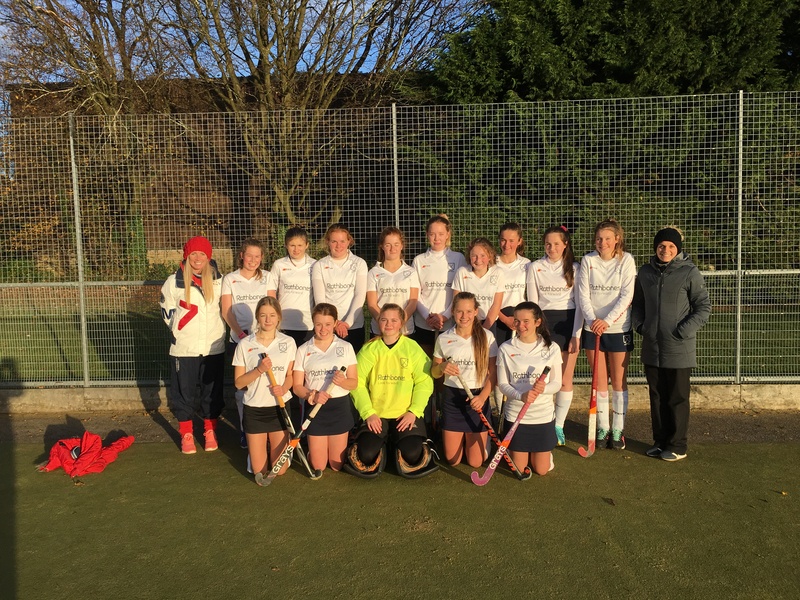 The U16 girls had a great start to their championship with two wins out of two. They beat Trojans 4-1 with goals from Kirsty Ludlam, Izzy Heelis and Olivia Besant and Alton 1-0 today with Ludlam bagging another goal. Fantastic results. Match reports to follow.